HomeScootersScooter NewsTVS Scooty Pep+: Which Colour Should You Buy? 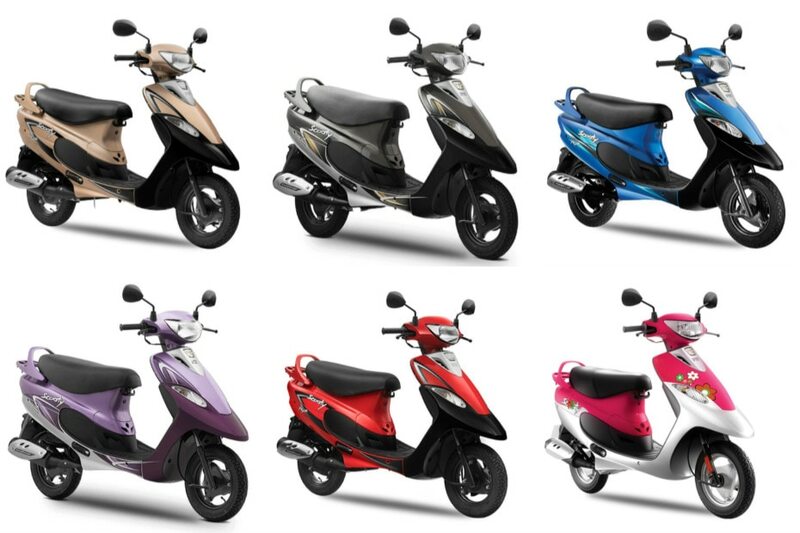 The Scooty Pep+ is now available in seven interesting colour options. Which one you should go for? We tell you. TVS has been selling the Scooty in India for a quarter of a century now. So, to celebrate its 25th anniversary, TVS decided to give the Scooty Pep+ a fresh look. The company has introduced two new colours for the Scooty Pep+: Revving Red and Glittering Gold. With the addition of these two new paint options, the entry-level Scooty is now available in a total of seven paint options. With so many colour options at your disposal, which one should you go for? Allow us to help you out. Out of all the colour options that TVS has on offer, this one looks the most… dull. TVS did try to make it look a bit funky with the contrasting black panels, but it just doesn’t go well with the scooter’s character. If you a knack for blingy things, this paint option will do just fine. However, the light shade of gold along with the black highlights gives the scooter a bland look. Unlike the other paint options, this one gets a body-coloured panel at the front. It’s not too loud like the red or too dull like the gold, but still won’t be our pick of this bunch. While this shade might not be the most attractive of the lot, it still is one of your safest bets. The black paint option may not resonate with most buyers but if someone is looking for a stealthy-looking scooter, this one is for them. If you are into unicorns, fairies or just love the colour pink, this could be the one for you. You either love this paint option or hate it, but you can’t argue with the fact that it will turn the most heads because of its in-your-face bright pink shade. TVS first introduced this paint option in 2016. And even though it’s a two-year-old paint option now, it somehow manages to look more premium than the other paint options. Out of the hundreds of colours options that are available in the market, red is the most difficult to pull off. Other than Vespa, not many scooters have been able to carry off this paint scheme. But the Scooty Pep+ looks stunning in this paint option. So, if you are looking to buy the Scooty Pep+, you could place this paint option at the top of your list.